French Ouarter Favorite has all the flair of New Orleans. Whether you are coming to the Big Easy for a romantic get away or to just visit the world known Bourbon St. Enjoy your stay at a fully restored historic 1850 building featuring 14 foot ceilings, exposed brick and original hardwood floors. Perfect setting with all the furnishings of home. Large pillow top king size bed, 42 Inch flat screen television, bose stereo ,galley kitchen with granite counter tops, gas stove. Microwave, refrigerator, coffee maker, secure entry and courtyard located on front side of building. Take a stroll just a few blocks away to the French Market which also features a Flea Market and a Retail & Farmers Market. Walk a few more blocks and you will see Cafe du monde and stop for some coffee and beignets. Shop at one of our many local venue's, then after just stroll a few blocks down and across the street to Jackson Square where you can enjoy a carriage ride tour of New Orleans History. You will also see some of our local artist's, palm readers and the St. Louis Cathedral. When your first walk out of the Condo, take a left and walk a few blocks to Frenchman Street where you can enjoy the best Jazz in town along with all the fine cajun cuisine or just a Po-Boy. Walk out your door to Bourbon Street for a good time and stop by Pat O'Briens for one of their famous Hurricane's plus plenty more bars and live entertainment. Walk less then a block to Port Of Call for one of their famous hamburgers and don't forget to try a Monsoon. WE LOVE TO SHARE THE HISTORY OF NEW ORLEANS!!! Bill & I were born & raised in New Orleans ..We live only 12 miles away from New Orleans . If needed we are available for our guest .We enjoy coming back on weekends to NOLA for the best entertainment in the world!!! We love the safety of the area & convenience of walking to many locations. When you walk outside the Condo there is so much to see and do you won't know what direction you want to go in. Take a right and walk almost one block and across the street you will see Port Of Call. A famous hamburger resturant which is also known for its famous drink, Monsoon. Take a left and walk about 4 blocks and you will see Frenchmen St. Take a left on Frenchmen and as you walk down the block you will have a choice of several bar and restaurants with live entertainment. If you don't take a left on Frenchmen St. then walk another block and take a right and you will be headed to the French Market. If you don't feel like heading left or right, then walk stright down Bourbon St. and get ready for the time of your life. When headed down Bourbon, stop at 941 Bourbon St. and visit the oldest bar in the U.S. 'Lafitte's Blacksmith Shop Bar. It was established around 1772. A coin operated washer is available in a building in the court yard. A coin operated dryer is available in a building in the court yard. Clean Unit. Close to local favorites. This is an ideal unit for a short stay close to Frenchman St. The unit is clean and has all the amenities. My stay was during French Quarter Festival. The location of the property was fabulous, within very nice walking distance of everything in the Quarter. The facility itself was absolutely wonderful. It had been updated very nicely, had extremely nice kitchenette and bathroom facilities, and was as clean as anything I've ever seen. I highly recommend staying with Cynthia. You won't be disappointed. Located in a convenient, safe and pleasant neighborhood. Building is very quiet and room is located on the second floor. Loved the exposed brick! A/C works well and easy to operate. Would have liked to see premium bedding but otherwise outstanding. Best sleep in NOLA EVER...!!! This is an excellent location for a stay in New Orleans. We were able to walk to all the places we wanted to go to. The condo had everything we needed to make our stay wonderful. There were plenty of towels, all the things needed to eat drink and cook. This was a very enjoyable stay. Sited on historic Esplanade Ave.in the French Quarter and corner of Bourbon Street . 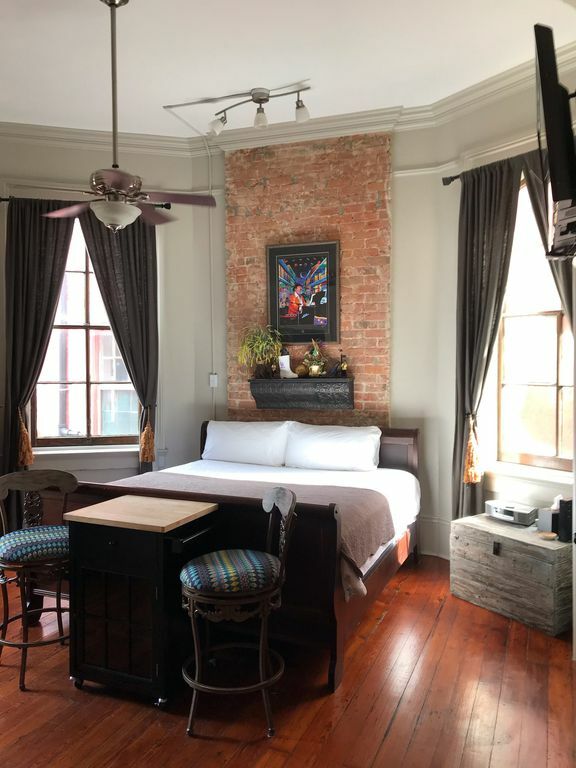 Just a few blocks to Jackson Square, St. Louis Cathedral, Museums, shopping, French Market, sports events , Casino's, Frenchman Street, world known restaurants-This Elegant Suite has the privacy and convience to the most popular New Orleans attractions.